Bed-based intermediate care is an important model of care to help people to avoid hospital or get home sooner. 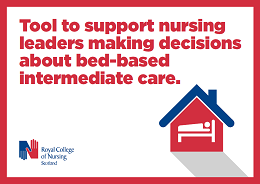 This tool from RCN Scotland sets out what nursing staff should consider when making decisions about bed-based intermediate care. Bed-based intermediate care is designed to help people avoid hospital or get home sooner, recover from illness, and plan for their future care. It is a model of care which sits at the heart of the Scottish Government’s vision for an integrated health and social care system. This tool is for nursing staff involved in decision making about bed-based intermediate care. The tool is designed to be used by those staff to think through what needs to be considered to ensure intermediate care beds are delivered in a planned and integrated way to provide safe and effective care. Alongside the tool, RCN Scotland has produced the report The landscape for bed-based intermediate care in Scotland. This looks at bed-based intermediate care in Scotland as well as how the model of care can contribute to improved outcomes for people and for Scotland’s health and social care services.